So I thought about giving a full on album review for the new Springsteen album Wrecking Ball, but I had two issues with that idea; one, the album isn’t overly interesting to write about and two, I was a bit short on time. Instead I’ve decided to review what I would consider a real oddball of track on Wrecking Ball in “Rocky Ground”. A lot of Wrecking Ball feels a bit forcefully political especially in an election year, but “Rocky Ground” takes political and adds a weird urban element that makes it sound like Lauryn Hill produced it. While that worked with “Streets of Philadelphia”, “Rocky Ground” is a monster unto its own. It’s essentially heartland hip hop gospel (if that makes any sense) boasting an gospel sample, an uplifting female hook, drum loops, lamenting horns , a gospel choir, and a super elementary rap verse written by the Boss himself and sung by gospel singer Michelle Moore. While this no doubt sounds like a train crash written out, it really doesn’t sound much better to the ears. Springsteen opens “Rocky Ground” with plenty of uplifting gospel clichés seemingly written for folks down from this recession including talks of downtrodden shepherds, judgment day, angels shouting hallelujah, and 40 days and 40 nights. Ordinarily, I love when Bruce throws in spiritual imagery since it’s such an essential part of American life (which Springsteen wonderfully illustrates in his stories) and as a Christian, I think it adds tons of substance to his music, but the overall urban vibe of “Rocky Ground” causes the lyrics to feel especially over the top. Let this be a lesson to the Boss that he is much better suited doing folk spirituals in the vein of Pete Seeger (like Wrecking Ball highlight “We Are Alive”), not urban gospel like Kirk Franklin. This song painfully reminds me of that cheesy feel-good Kid Rock and T.I. song “Care”, and although I love the fact that Kid Rock promotes the best team in professional sports (“Mach Man” Matt Stafford’s Detroit Lions) and my friend does one of the meanest renditions of “Only God Knows Why” in karaoke, it’s usually not good to take your musical cues from the Kid. While this was clearly an experiment gone wrong for Springsteen, you have to give credit for effort to an artist like the Boss, who can no doubt keep doing what he does and continue to please his sea of followers but instead has been willing to take risks; something great artists do. I just recommend that the 62 year old Jersey boy stays away from rap in the future. i cant see why this album is getting rave reviews. It is a sappy album with alot of slow songs & bores me. The only song i like is the celtic themed song. I guess not only fans think this guy can do no wrong but i guess critics too. this aint no Nebraska, nor does the E street band have any part in it only to play what they are too play. I grew up listening to a lot of Springsteen records but I find his last 3 studio efforts including this one underwhelming. I read in quite a few reviews about the rap bit being his attempt at cross-over. I seriously doubt if the man cares too much for that. This one’s probably just an experiment – an experiment that fails. But like you say, he’s trying different things. I’d rather have a musician do that than just sit it out. I think “Wrecking Ball” is a pretty good Bruce album by recent standards – maybe 7/10 – but “Rocky Road” isn’t one of the best. Bruce and rap is clearly not a match made in heaven. It’s the kind of song with a bit of this and a bit of that which seems custom-designed for one of those big events like the Superbowl – or an Obama campaign slot? 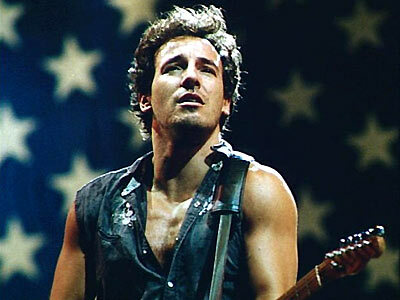 I’m a Springsteen fan from the 1980’s + and an avid music listener from folk to alternative to some rap. Keeping up on the music scene through my daughter, now 19 yrs old, has been an interesting journey. Sometimes artists, and ourselves as well, get stuck in a music genre. I’m happy to see The Boss take a risk and I love Rocky Ground. The real test is how well it does on the charts. Thanks for the comment, Amy! I can’t say I love what Springsteen did with Rocky Ground, but I do appreciate that he has not stagnated like a lot of aging artists, and changes things up here and there. Next Next post: Chairlift’s Brilliant New Music Video … Watch/Play It NOW!